During the sixteenth and seventeenth centuries, transoceanic travel allowed for increasing contact among different parts of the world. For the first time in history, many nations across Eurasia shared a roughly comparable level of social, cultural, and technological sophistication. Thus, it was possible for people to compare themselves with others and to learn from one another. This situation gave rise to a period of intense social and cultural competition in the international arena. Paper, printing, and print culture, with private publishers and a sizable reading public. Gunpowder, guns, cannons, and rockets (invented in China and developed in Europe). Practice of collecting masterpieces of art (important for international competition during this period). Places where private persons could meet and discuss public issues: tea houses, coffee houses, gardens, and restaurants. Increasing national budgets and expenses that led to attempts to develop more complex and effective administration for governing an early modern state. A thriving commercial culture in which people began to make purchases of luxury items, rather than bare necessities. 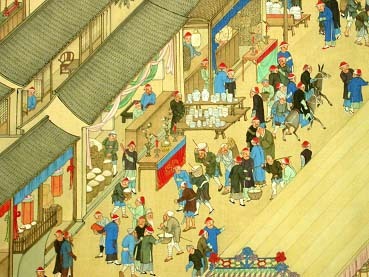 Detail of a cityscape: People buying rice, porcelain, and other commodities. Anonymous, 18th century. Courtesy of Palace Museum, Beijing. Not all countries were equally developed in all these areas. Europeans were more advanced in the areas of science, technology, and weaponry. However, the popular printing industry in seventeenth-century Japan had reached a level of development that Europe did not achieve until the eighteenth century. China was developed in several areas (its cities were still the largest in the world), but its strongest suit at the time was political administration, which long ago had disengaged itself from aristocratic authority. Many Jesuits recognized this and wrote home with amazement at the fact that Chinese officials were subject to the law just like anyone else! Most developed nations at that time were trying to find ways to centralize their administration. Centralization is necessary before any country can modernize. In traditional governments, such as in medieval Europe, political authority was scattered among the nobility, and social position was determined largely by birth. This limits the degree to which social resources can be organized and limits the talent pool for important jobs to those people born into (or married into) noble families. Moreover, decentralized authority was inherently unstable. Therefore, many early modern monarchs tried to find ways to increase the authority of the monarch so that the state could organize resources more effectively. Men like Louis XIV in France and Peter the Great in Russia claimed that they had a special relationship to God and ruled by “divine right”. In eighteenth-century Europe, “right” meant an inherited and inalienable privilege; thus, Louis XIV’s authority to rule could not be challenged. Louis XIV demonstrated his brilliance by building the penultimate European palace in Versailles, just outside Paris. It was clearly much grander than any palace owned by lesser nobility and thus supported his claim to absolute authority. The Palace of Versailles became widely known through the circulation of its many images, which included engravings. Peter the Great and other monarchs tried to imitate its buildings and gardens so as to demonstrate their own greatness. Louis XIV and his successors even sent books with engraved images to the Chinese emperor, which may have provided Emperor Qianlong with the idea of building the European Palaces. Separation of the State Budget and Administration from the Court Budget: Many times in Chinese history, statesmen had informed the emperor that he could not mess with this or that because it belonged to the state or to the people, and not to the emperor! Taijian System: Another check was a separate branch of government whose purpose was to expose abuses of power by anyone, including the emperor himself. In Chinese, this was called the taijian system. Europeans (misleadingly) called it the “Censorate,” but were very impressed that in China it was possible to criticize the monarch. Public Criticism: A long tradition of public criticism had existed in China. Literary collections of China’s greatest writers reveal that all of them wrote pieces in the genre of social criticism (fengyi). This literature could have an affect on public opinion (gonglun), which was of great concern to the government. Because the authority of the Chinese emperor was linked to his civil policies, the function of the palace and its gardens may have been aimed more at other countries and visiting dignitaries. Having received prints of the grand palaces at Versailles, it is not surprising that Emperors Kangxi and Qianlong would want similar prints made of their own gardens so as to influence the international impression of China. The development of a “natural style” of gardening was very important for England as a nation at that time because international cultural competition in Europe, as elsewhere, took place largely in the realm of art. For example, all European monarchs competed in building collections of classical sculpture and famous Renaissance paintings. But, even as England’s economic and military power grew each year, the nation found itself at a disadvantage in comparison to other European nations because it lacked a tradition of visual art that could compete with that of Italy or France. Therefore, when the English developed the “irregular” garden (as it was called), distinct from the rigid, geometric garden traditional to Europe, the “irregular” garden became the pride of the nation. In 1764, Thomas Gray admitted that the Chinese had probably invented the natural style, but insisted that the British had not known about China when they independently invented it. In fact, several influential descriptions of Chinese garden taste had been published in English before and after the 1720s. Yet, if Gray were to admit the debt to China, then England would lose its only claim to superiority in the realm of visual art at a moment when it desperately needed some claim to cultural glory to match its growing military power. Competition between China and England became more intense over the years. Because of the enormous demand for tea and porcelain in Europe, Britain had a large trade deficit to China at this time and wanted to force the Chinese to purchase more European products, but China resisted this, reasoning, perhaps, that a trade deficit was not in its national interest. Similarly, both China and Britain, as major imperial powers, had their own ways of claiming superiority through diplomatic protocol, but the British were incensed that the Chinese claimed the same kind of status as England. 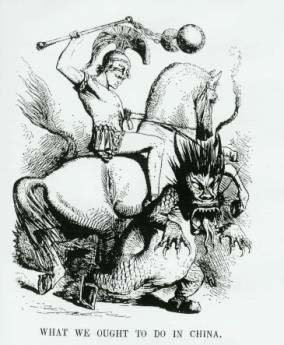 All this encouraged the demonization of China in the European press, such as the example in a Punch cartoon of 22 December 1860. Eventually these strains led to military conflict (see China and International Law in the Nineteenth Century). In 1860, British and French armies invaded China and briefly occupied Beijing and the surrounding area. They completely destroyed the Garden of Perfect Enlightenment and looted many of its beautiful objects. The European Pavilions also were burned and today remain as ruins in a public park. Of the two hundred original sets of engravings, only about five sets survive in complete form today. The British then forced China to accept opium as a trade item, claiming that China was unreasonably closing its ports to “free trade” (imagine how most Americans would feel if some other nation accused the United States of unreasonably stifling free trade because US Customs seizes drugs before they can cross the border! ).